24-Aug-2011 -- My dear friend Mr. Ardabili and I started from Tabrīz in East Āzarbāyjān province at 9:30 a.m. and drove towards Bostānābād along the Tabrīz-Tehrān road. After completing his paperwork, we went on to the village Oštolaq-e `Olyā and to the confluence point, where we arrived at 11 a.m. The confluence point is located on the farm of Mr. Yūnus Navīdī. 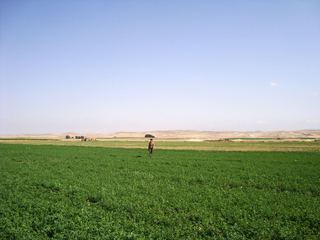 Alfalfa is grown on the farm and its area is 2 hectares. A sprinkler system is used to irrigate it. This is my second and Mr. Ardabili's 3rd CP.